The story behind the name: The constellations that are included in the Zodiac - the 12 constellations recognized by Babylonian astronomers through which our Sun, moon, and planets appeared to travel during the course of a year - are considered to be among the oldest sky patterns recognized by human civilizations. They were thought to have more significance because they were touched by the Sun. While the pattern of the Gemini is old and relatively easy to recognize, there do not seem to be specific myths from many cultures connected to it. The story most closely associated with Gemini is the legend of Castor and Polydeuces (Pollox in Latin) from Greek mythology. 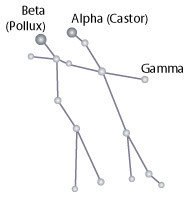 Castor and Polydeuces were identical twins born to Leda, Queen of Sparta, by two different fathers. Castor was said to be the son of Leda's husband, King Tyndareus and thus mortal. Polydeuces was said to be the immortal son of Zeus, from Zeus's seduction of Leda while he was disguised as a swan. The same encounter also produced Helen of Troy. Tyndareus adopted Polydeuces. The twins were inseparable and became known as the Dioscuri (sons of Zeus). Meanwhile, in another country, the wife of the half-brother of Tyndareus also gave birth to twin boys, Idas and Lynceus, and in a somewhat parallel legend, Idas was supposed to be the son of Poseidon. They had the same close relationship with each other as their cousins. Bad blood was generated between the two sets of twins when the Dioscuri kidnapped and had sons with the women who were betrothed to their cousins. Years passed and both sets of twins became famous for various physical and mental skills. They all ended up on Jason's voyage to find the Golden Fleece. During the trip they became reconciled and decided to go on a cattle raid together. There are many stories explaining why they reopened their feud. One story says that Idas cheated the Dioscuri of their fair share of the stolen cattle and the Dioscuri stole them back. A fight broke out and Idas killed Castor with a spear. Polydeuces then killed Lynceus. He was badly wounded in the process, giving Idas the opportunity to finish him off, but Zeus intervened and killed Idas. A different version says that Castor killed Lynceus and demolished the monument Idas had erected to him, causing Idas to kill Castor, and Polydeuces to kill Idas. There are other stories that say these same three were killed in battles, raids, etc. Polydeuces survives in all versions. Zeus granted Polydeuces' wish not to outlive his brother, but since Polydeuces was an immortal, they were still separated (as a mortal who died, Castor was destined for Tartarus). Polydeuces refused immortality unless Castor could share it, so Zeus allowed them to split their time in the heavens and under the Earth. To honor their brotherly love, he put an image of twins in the sky.